I'm only showing this video of a SMB1 hack called Tower RE because I want to know how can I make backgrounds like the one in the video? And make the ? boxes and coins animated? Last view: 1266 days AW2 Design Maps just got about ten kinds of more awesome to actually sit and use. At first I thought you replaced the function of "File", but then you couldn't do the random option, right? So what buttons are you pressing there? Last view: 1266 days Left and Right go through the song list and R hits a random song. Please excuse the numerous mistakes I made during recording. I strongly encourage feedback. And I will release the hack tomorrow. Just allow me one more day to make anymore necessary corrections. Last view: 99 days Cool SMB videos, reminds me when I used to hack SMB. Last view: 2513 days What do you think about the graphics? Last view: 99 days The graphics are pretty cool, a mix of your own brings new flavor into the game. Last view: 2 days I played through the hack a few days ago. Sweet stuff. The fact that the hack is only 4 worlds though left me wanting more! 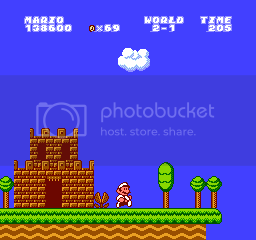 It should be noted that once the game is beaten, if you use B to select a world, since you used areas that were originally Worlds 5 to 8 for your levels, it makes for some peculiar starting points. Perhaps the ability to select worlds should be disabled? Also, there are a couple of places that the player can get stuck in. It's pretty easy to slide into a one-block high area and not be able to get out. 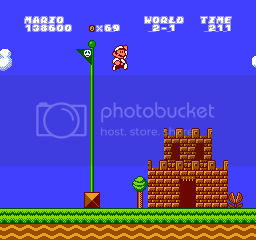 After jumping over the flagpole, display of the proper level data messes up. 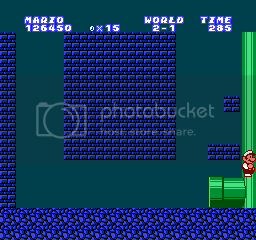 I'm not familiar with how Super Mario Bros. works, so I'll leave the verdict up to you on that one. 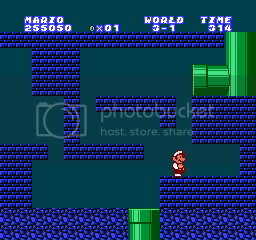 Also, in the underground area that is accessible in 3-1 (as well as at least one other area if I remember correctly) if Mario breaks the bricks as shown, he has no way to exit through the pipe. 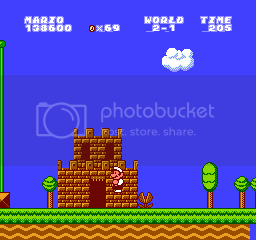 Would it be a good idea to put a brick coin block instead or whatever the proper identification is for Super Mario Bros.? I'm looking forward to the other nine hacks in the series! Keep it up man! Last view: 1234 days Every fifty days or so, I get the sudden urge of hacking this game again and again... don't ask me why I just do.. anyway where were we at? Aaahhh yes, screenshots.. new ones at the very least..
Every fifty days or so, I get the sudden urge of hacking this game again and again... don't ask me why I just do.. anyway where were we at? Aaahhh yes, screenshots.. new ones at the very least..
Wow, just wow. I love the new color theme and new graphics. I must admit that I am anticipating this hack a lot. More for LOL value than anything. Better than any hack made for SM64. 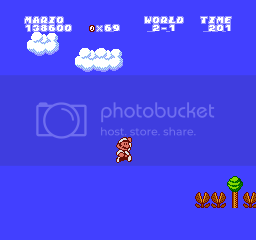 BTW: I am trying to do the same with a NES emulator. I like the classic jumping sounds. MySQL - queries: 108, rows: 149/0, time: 0.073 seconds.